Article written by Bonnie Way from the Vancouver based blog "The Koala Mom"
“Today is our dentist appointment!” Sunshine announced at breakfast. I smiled and decided not to tell her that most people aren’t quite as excited about visiting the dentist. 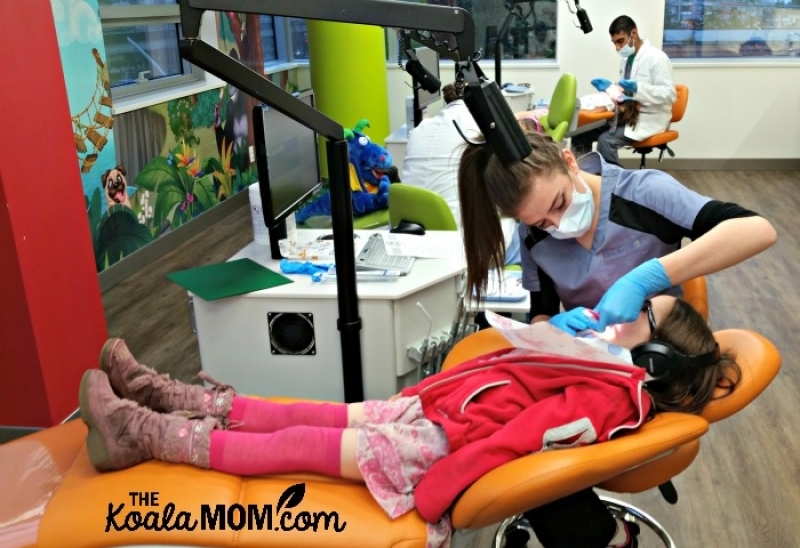 Ever since she found out I’d booked appointments at Smiletown Dentistry in Burnaby, she’s been telling her sisters all about how much fun the dentist is. She went to the dentist about two years ago, when one of her adult teeth came in beside a baby tooth. Despite having the tooth pulled, she enjoyed getting fussed over at the dentist—and getting a toy after. Just before noon, we loaded the girls in the van and headed over to Smiletown Dentistry. It’s located in a newer office tower close to Metrotown Mall (just off the Skytrain). We found parking on the street (but there’s also parking underground) and rode the elevator up to the office. It was easy to find: the double glass doors have a brightly coloured jungle scene on them with the Smiletown name and logo. Inside, the office looked more like kids play area than a dentist office. The jungle theme continued with fun murals on all the walls. There were benches around the office, but also small chairs located in front of two iPads, a big screen TV and another smaller screen TV, and a collection of kids’ toys in the corner. While I filled out the paperwork for the girls, they explored the office. Jade parked herself in the TV room, watching Paw Patrol (her favourite show) and didn’t budge from there until it was time for her appointment. Sunshine found the iPads and began playing games there. Lily tried the iPad and then settled on the bench watching another show on the second TV. My husband grabbed a coffee at the snack station near the door. With the paperwork done, I got a hot chocolate for myself and watched the girls play. There were a couple other clients ahead of us, but the office was quiet and the girls were busy so we didn’t mind the wait. Pearl woke up and I nursed her in a corner of the TV room, though I later found out that there’s another room in the back for nursing moms or moms with babies. Soon, both Dr. Kanani and Dr. Chadha came out to meet us and welcome us into the back. They gave us a tour through the beautiful, bright offices. They were still moving in when I was there, but they have thought of everything for the comfort of their clients and families. The office space is big and welcoming, with bright colours and more murals in the back to make kids feel at home. We returned to the examination room, which had surprised me with its open concept. Three dentist stations sat in a big, open room. Dr. Chadha explained that the open space is more comfortable for kids, who see other kids having fun (hopefully!) and are less scared about getting their own teeth checked. At one end of the room is a couch for parents to wait on while their children have their exam. The girls each picked a dentist chair, where they found a stuffed dinosaur and a big toothbrush waiting for them. While the dentists and dental hygienists got ready, the girls were encouraged to brush their dino’s teeth. Jade loved this! She and Lily both said that was a highlight of their visit. That was a great way to introduce the girls to the dentist chairs. Sunshine and Lily then put on headphones and leaned back in their chairs to watch a movie on the TV above while Dr. Kanani and a dental hygienist checked their teeth. Jade’s chair wouldn’t recline, so Dr. Chadha checked her teeth sitting up. I wasn’t sure how Jade would react to the various dental tools, but she was a model patient. Dr. Chadha was patient and gentle, explaining each task before she began, and Jade co-operated completely. We found out that Lily and Jade have twenty teeth each, and Sunshine has twenty-four. The dentists polished the girls’ teeth and put on a special fluoride treatment that dries instantly (so they don’t have to wait half an hour before eating or drinking). The girls were all cavity-free, which was great to know! They usually brush their own teeth (even Jade, who doesn’t want me to help her anymore) so I was happy to find out they are actually doing a good job of that. Because Sunshine has some adult teeth already, she also got an x-ray taken. I could tell that was a bit uncomfortable for her (who likes the thing they stick in your mouth for x-rays?) but even then, Sunshine didn’t complain. She still had two dentists fussing over her and was doing something her sisters weren’t! While she did that, the other girls got to go back to the TVs and toys. And that was our visit to Smiletown Dentistry. Since then, the girls have been taken great care of their teeth and both Sunshine and Lily have started flossing. 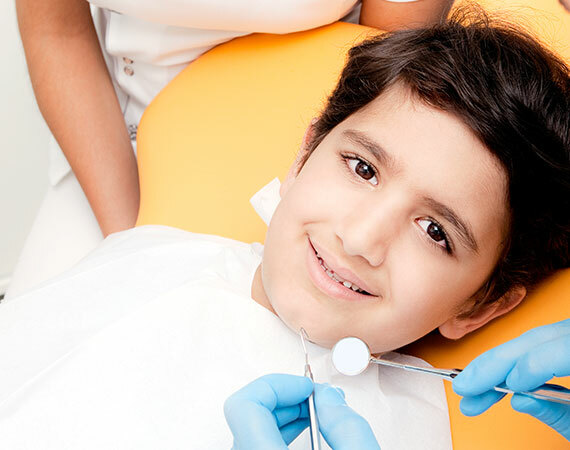 After that experience, I would heartily recommend finding a pediatric dentist for your kids. Dr. Kanani and Dr. Chadha were great with the girls, who are super excited to return in the summer for their next checkup. 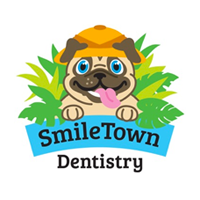 For more about Smiletown Dentistry or the dentists, visit their website. If you are new patients, you can book a complimentary consultation to meet Dr. Kanani or Dr. Chadha and discuss your child’s dental needs. You can also book appointments via the website. 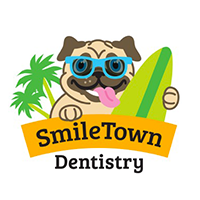 If you don’t live in Burnaby, check out the other Smiletown Locations in North Delta (Surrey) and Langley. Before visiting, you can also download a FREE kids activity booklet to help your kids prepare for their visit. We received a complimentary visit to Smiletown Dentistry; all opinions expressed are my own.